The breakfast was great, you could pick whatever you wanted and spend the whole morning at the table. 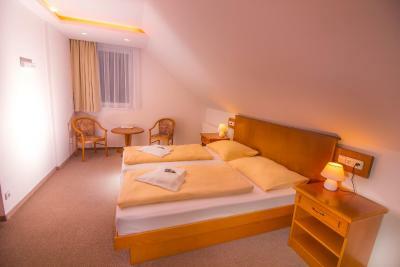 The property has sauna (don't expect relaxing environment in the relaxing room) and a small swimming pool. Walking distance to town, comfortable room, large bathroom, balcony. 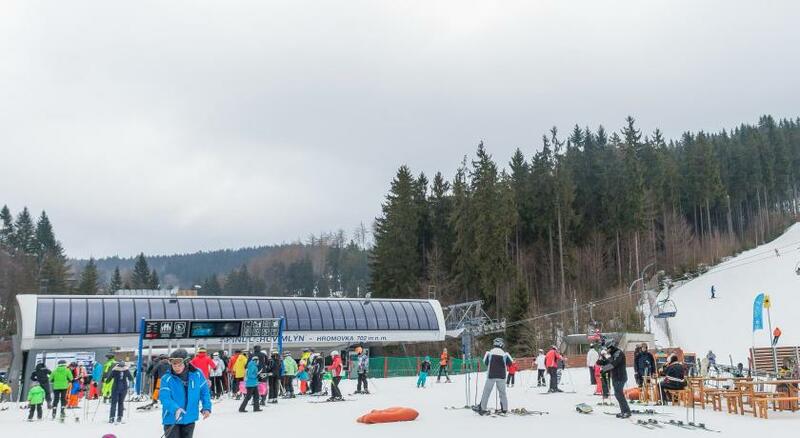 Close to ski slopes and lifts boths for pros and amateurs. Large parking. Good size bedroom for a family of three, beds were very comfortable. Rooms cleaned everyday. A good breakfast buffet served every morning. 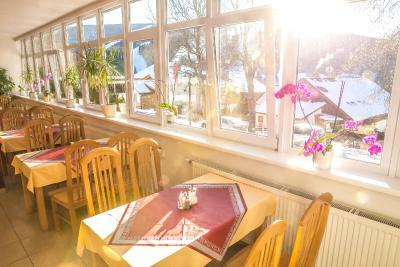 Located just a short walk into town and to the nearest ski bus or slopes (Harmony lift). Staff were friendly and helpful. Very close to slopes about 400m walk. Great views of mountins. Amazing souna 90 degrees C. Good breakfast.Great staff at the reception. The location is excellent. 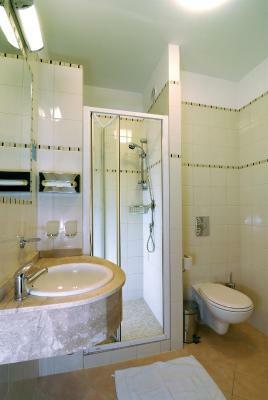 The Room is renovated and bathroom was new. 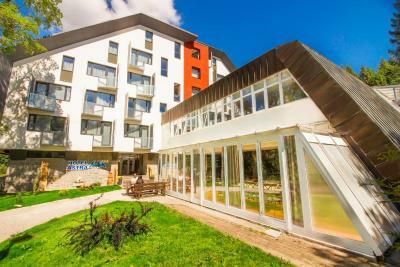 Great location, top of the hill, not far from the city center, just enough peace and quiet. The views from the mountainside suite room were amazing (5th floor). Pool & sauna are a good bonus. 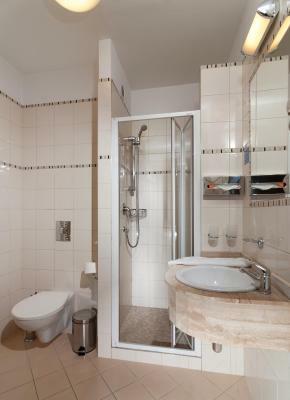 Rooms are very clean, wc and showers looked completely new. (12/2017) High quality wifi for each room (separate channel), DLNA capable huge TV that connects toa smartphone on the fly easy with a free app to stream basically anything. Heating automated. Staff - helpful, welcoming, all smiles. Location of this hotel is nice. Ans price is reasonable. aamiainen oli juurikin hyvä, jolla sai hyvän startin päivään, oli munakasta ja makkaraa, vihanneksia ja hedelmiä ja makeaa jälkiruokaa, yhtenä aamuna kahvi loppui kesken ,mutta ei paha ongelma. saunan varaaminen kävi kätevästi, vaikkakin kaiketi tyypillinen keskieurooppalainen, eli vettä ei saanut kiukaalle heittää , (no kiviäkäkin kiukaassa oli yhdeksän kipaletta ) ja saunan ohessa oli kiva käydä uimassa hotellin uima-altaalla, näin päivän rasitukset sai saunomalla ja uimalla hoidettua. auton sai veloituksetta pysäköityä hotellin pihaan., jossa oli sesongin loppuvaiheessa hyvin tilaa kokoajan. huone oli tilava ja sängyt mukavat, huoneessa oli tosin suhteellisen lämmin, mutta se ongelma poistui, kuin laittoi parvekkeen oven yöksi raolleen . hotelli oli rauhallinen ja lyhyen kävelymatkan päässä varsinaisesta kylän keskustasta, tosin takaisinpäin kävellessä alkoi tietty vähän maitohapot rasittaa kehoa. 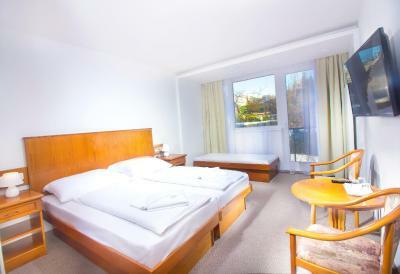 Hotel Astra This rating is a reflection of how the property compares to the industry standard when it comes to price, facilities and services available. It's based on a self-evaluation by the property. Use this rating to help choose your stay! 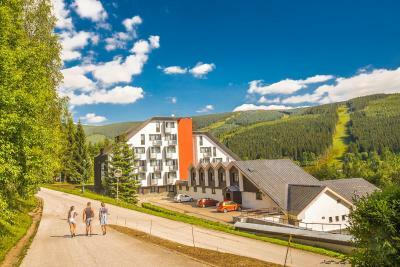 The Hotel Astra is located amid the Krkonoše mountains, in the famous resort of Špindlerův Mlýn, and offers you fully rooms with attached bathroom with balconies and a swimming pool. Amenities of the Astra hotel also include a sauna, a solarium, massages, a bowling alley and billiard tables. 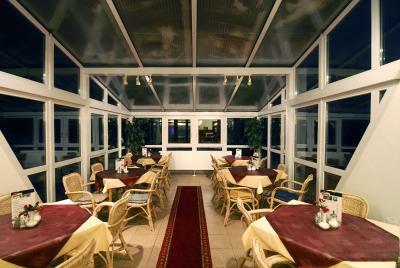 You can choose between 2 restaurants, relax in the conservatory and make use of a private room for various events. 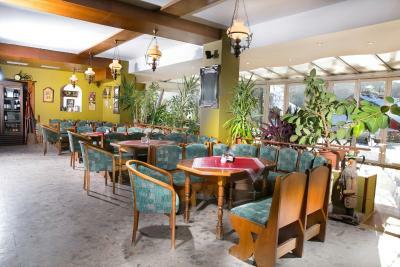 Wireless internet access is available free of charge in the public areas of the Hotel Astra. 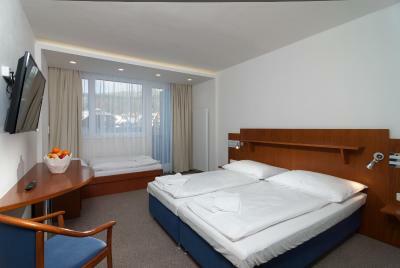 When would you like to stay at Hotel Astra? This room comes with a private bathroom with a shower and a TV. Some rooms have a balcony. House Rules Hotel Astra takes special requests – add in the next step! Hotel Astra accepts these cards and reserves the right to temporarily hold an amount prior to arrival. 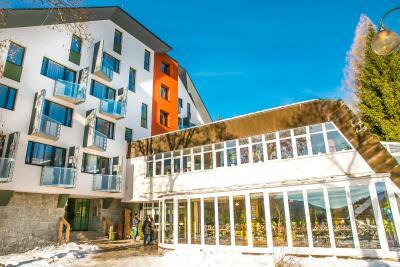 Please note that the property accepts only payments in CZK or payments by a credit card. A baby cot is available for a surcharge of EUR 2. Why they no have a gym!? The staff were consistently grumpy and unhelpful. Whether at reception, in the restaurant or using the facilities, everything seemed too much trouble. Also the single elevator was not fit for purpose. Often the door was not closed so it could not be called. We had to take the stairs (3rd floor) 80% of the time. The facilities (sauna, pool, pool tables, bowling alley etc) all look good on paper but are all a bit tired and in need of a bit of tlc. The location is not ideal either. It's about a 20 minute walk to the town centre, in good conditions. With iced roads and no pavements, it's even longer. 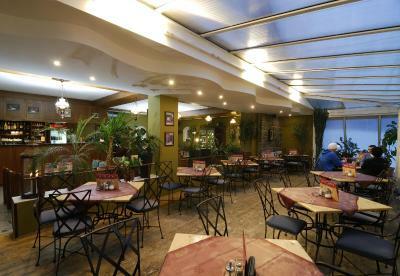 The restaurant is not great (small menu, not great food) and breakfast is quite limited, but plentiful and adequate. Short opening hours for dinner, restaurant serving till 21:30. Poor breakfast selection. 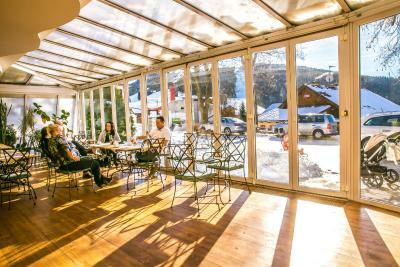 Short opening hours for ski rental at the hotel - closed by the time breakfast finished. Pool and wellness facilities leave a lot to wish for, it only looks well on pictures - very dated and not guest friendly - keys for sauna had to be collected from hotel main reception which is in public area, sun beds on different floor from the wellness area, accessible only through public areas again. New year's eve celebration party included in the rate but very difficult to call it a party - some random food served some music played, if I knew it will look like this I would book different NYE party, left to the room 9pm and watched TV as it was more entertaining. No option to charge bar / restaurant purchases on the room, had to pay there and then. Not worth 3 🌟, even if hotel have pool , kids corner.. 4 bedroom with sofa without madrass... Poor breakfest , long wait time for food from restaurant and bad English speaking stuff!!. Showers were a little underwhelming and certainly wouldn't wake you up in the morning. Rooms were smaller and very bare and sparse compared to what we expected from pictures. Receptionist was not very welcoming or communicative. The staff was not very informative, showing lack of interest. The restaurant was closed in the evening what we found out only once we sat at the table (only bar was running with noisy football) so we didn't have dinner and there was also no place to eat in the city. Breakfast quite basic - No breakfast available on final morning despite leaving at 7am. A few persons at the reception were not so friendly. Good location. Friendly bartender.Clean rooms. Not very helpfull or friendly in the restaurant and food too solty. Power outlets in our room in some of the evenings were not working (only in the bathroom). Employees could be a bit better at English. Restaurants could be with a better variety and quality. Location could be better and it seemed the ski bus was not close by (we used taxis).